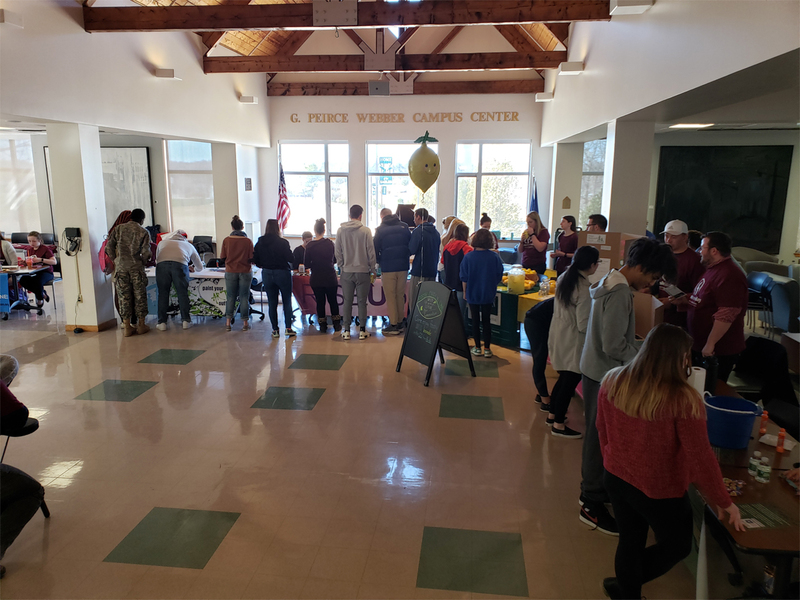 BANGOR, MAINE - Husson will be holding its second annual Fresh Check Day at the G. Peirce Webber Campus Center in Peabody Hall on the University’s Bangor campus on March 27, 2019 from 11 a.m. -1 p.m. Initially created by the Jordan Porco Foundation, Fresh Check Day is an event designed to promote positive mental health and suicide prevention. The event will feature interactive booths, peer-to-peer messaging, support from multiple campus departments and groups, free popcorn, exciting prizes, and giveaways. Fresh Check Day aims to create a bridge between students and the mental health resources available on campus and in the Greater Bangor area. There will also be opportunities for students to relieve stress. A ball pit at that students can play in is being provided by U Belong. In addition, there will be two massage therapists providing chair massages to students for the majority of the event. The massage therapists are volunteering their time and services. Husson University encourages students who are experiencing emotional or psychological distress to speak to a professional. Any student who feels he or she needs assistance can speak confidentially to one of the trained professional counselors located on campus at the University’s Wellness Center. They are available to provide free, time-limited services to all Husson University students. Husson counselors work to provide a confidential, objective, and supportive environment that allows students to better understand the sources of their problems and identify ways to solve them. Mental illness is more common than people think. According to the National Alliance on Mental Illness, one out of every five adults in the United States experiences a mental illness at some point during their life. In fact, 43.8 million U.S. adults experience mental illness in a given year. Fresh Check Day is a growing national initiative designed to prevent suicide and increase awareness of mental health issues. The first Fresh Check Day took place in 2012. The event has grown significantly since then. “Over the past year, there were more than 300 Fresh Check Days at more than 150 colleges and universities in 37 states, impacting more than 40,000 college students,” according to the event’s website. More information about Fresh Check Day at Husson University can be found at http://freshcheckday.com/schools/husson-university/. To learn more about counseling services at Husson University, contact Colleen Owens at owensc@husson.edu or call 207-941-7184. The Jordan Porco Foundation’s mission is to prevent suicide, promote mental health, and create a message of hope for young adults. They accomplish this by providing engaging and uplifting peer-run programs. Their programs strive to start a conversation about mental health that reduces stigma while encouraging help-seeking and supportive behaviors. The Jordan Porco Foundation is named in memory of the co-founder’s son, Jordan. Jordan died by suicide in 2011 as a college freshman. What started as two grieving parents’ vision has grown into a nationally respected Foundation that helps tens of thousands of young adults across the country. Learn more at jordanporcofoundation.org. “Mental Health Facts in America,” National Alliance on Mental Illness, https://www.nami.org/NAMI/media/NAMI-Media/Infographics/GeneralMHFacts.pdf. Suicide Prevention, “Introduction,” https://www.nimh.nih.gov/health/topics/suicide-prevention/index.shtml, as of March 22, 2019.